For wireless consumers, small cell wireless promises ultra-fast connections, stronger signals, and exciting new technology and services. However, for asset owners and joint use professionals, managing the deployment of small cell equipment can present many difficulties. If you read the other articles in this series, or if you are a joint use professional, you are familiar with the latest small cell technology. To recap, small cell is a compact antenna system ranging from the size of a TV remote to as large as a backpack, and it provides wireless service to limited coverage areas. It serves anywhere from a handful of users to several hundred, depending on the type of small cell attached. Small cell is versatile – it can be used to boost signals in large stadiums and it can also be used to provide coverage to remote residences where broadband has not yet been fully deployed. Small cell equipment is often attached to utility poles and street light poles; it can be mounted on buildings or amphitheaters. It is typically deployed quickly and is less design-intensive than traditional attachments. While there are many expected improvements as a result of small cell technology, below is a list of five specific advancements. The next generation of wireless networks will support heavy use of video and meet consumer demands for faster, more dependable connections. Downloading a two-hour movie (which takes about 6 minutes with 4G) will take an estimated 3.6 seconds with 5G. The next generation of mobile tech is coming quickly – AT&T and Verizon have both said they expect 5G phone rollouts in 2019, and may have some 5G devices available by the end of 2018. Consistent coverage is extremely important to users. A recent report found that 96% of people born in 1980 or later stated that mobile phones were the single most important item used in their daily life. More businesses are including cellular infrastructure as an amenity in their building space. For example, coffee shops, apartments, and office spaces are including cellular infrastructure as an amenity to consumers to make staying connected easier. According to an article on Construction Dive, “These vital extras are what distinguish one office environment from another, and the list of amenities that should be moved to the must-have category starts with technology.” Small cell wireless has the capacity to mend existing gaps in coverage through geo-targeted placement of small, limited-range attachments. The new rule of IoT is that “Anything that can be connected, will be connected.” Integrated technology is here, and users are multiplying rapidly. One group of researchers estimates that by 2020, 24 billion IoT devices could be in use worldwide – four for every person alive. Coordinated connections among vehicles, appliances, and home systems create high density demands on wireless connectivity. Small cell wireless will add reliability to users’ control of such systems. IoT also encompasses wearable tech, health-monitoring devices and many other possibilities. Some places, such as a concrete stadium filled with 80,000 sports fans and their devices, are especially challenging for wireless service. Small cell wireless can improve service in those places, as well as airports, transportation hubs, hospitals, government buildings, and densely developed urban areas. Because of expanding coverage and consistent connectivity, safety across the country will potentially increase. When emergencies occur, victims or bystanders can rest assured that their cell phone service will reach the other end of the call. First responders rely on networks and cell service to communicate life-saving instructions to their field crews. Currently, cities that plan to convert to smart cities are focusing on public safety as priority, as well as energy and transportation. These five predicted outcomes of small cell technology will expand the nation’s ability to communicate and stay informed and connected. These five key results are just a few of the reasons to get small cell wireless in place. Small cell has the potential to make wireless customers happier, safer, and more productive with their service. However, even with all the good that small cell technology brings, there are challenges that follow. Behind the scenes, paperwork and requests are flooding asset owners’ desks. No official process has been documented for joint use departments to deal with the incoming volume of small cell inquiries. Municipalities are scrambling to create official regulations. 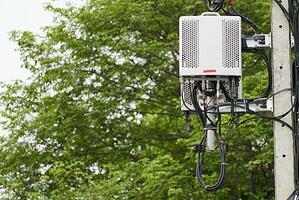 The differences in past regulations contributes to the confusion of the small cell boom. Some states allow more attachment options than others, and requirements may vary for height, circumference, and the type of antenna allowed. Many companies involved hope that state legislatures will act soon to create uniform standards, while other companies are wary of losing control. In the meantime, asset owners bear a considerable burden. The safety and reliability of a company’s power system is of utmost importance, so careful attention to joint use departments is a must. Some asset owners have reported receiving joint use requests for small cell attachments in a variety of ways. Companies that perform utility pole audits are reporting they have more small cell attachments than the number of joint use requests previously received. Performing the necessary due diligence is a serious challenge. Companies need strong coordination among departments and solid procedures for handling joint use requests and communicating with small cell contractors. What challenges has the rapid growth of small cell wireless created for you? How have you addressed these challenges? Let us know in the comments section how small cell has impacted your business. Help us create a conversation about small cell and joint use management.